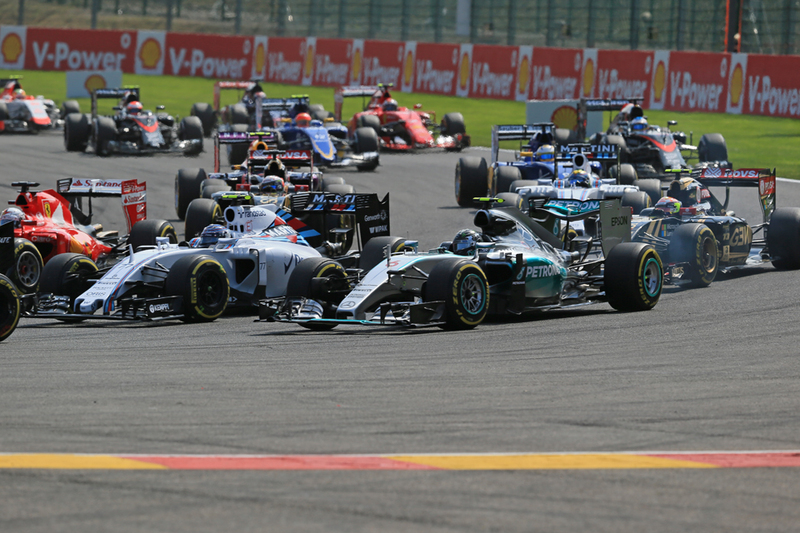 Add too that F1 races at Spa almost always are diverting ones, that provide more action, incident and unpredictability than several other rounds around it combined, and the popularity of the place is complete. I'm sure there have been dull races here, but it's not all that easy to cite them. The four-week summer break that separates this Grand Prix weekend with the previous one in Germany will have given all much opportunity to ponder the perennial question of whither Mercedes. The silver squad as ever enters this weekend as firm favourite. The Spa track with 70% of it being full throttle and much of the rest being sweet turns should suit the W07 down to the ground. 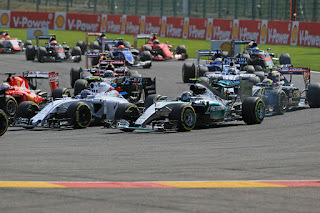 Last year the Mercs ran away - Romain Grosjean in third finished some 37 seconds after the winner. But this time there is an elephant in the room, one that has been lingering for a while. 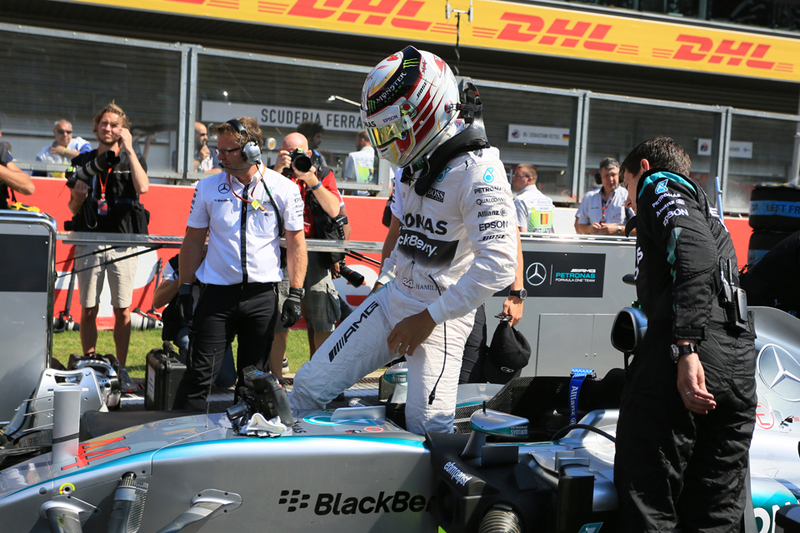 That of Lewis Hamilton and his power units. Several failures early in the season have meant that at least one grid penalty and more likely more than one in the remainder of 2016 have since been likely. And Lewis has been saying that he'll take them - anything up to a drop to the back of the grid - either this time or in the next round at Monza. For many reasons taking his hit in this one makes more sense. 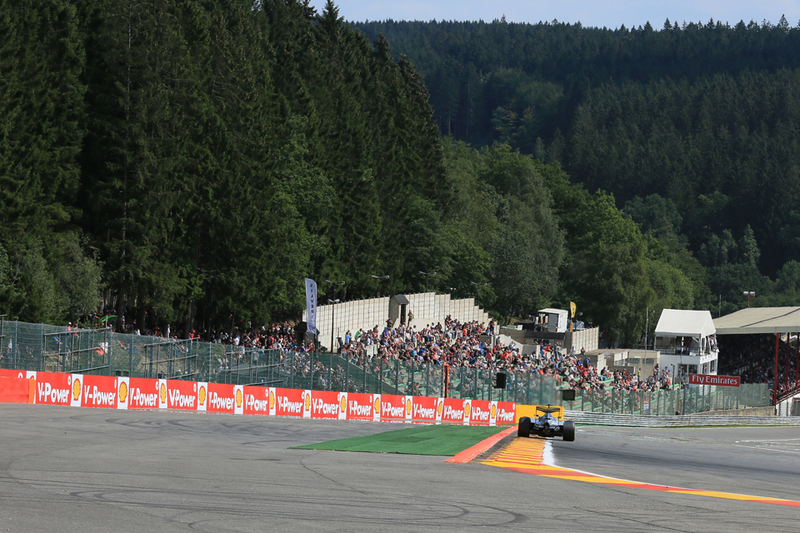 Overtaking is easier - particularly in the extended full throttle section between La Source and Les Combes - there will likely be more pit stops than at Monza as well as is a higher likelihood of safety cars. And, Lewis said in Hockenheim, with such a drop it's probable that his stable mate Nico Rosberg will get a "Sunday drive" to the win, and given the form of the Red Bulls in particular Lewis isn't confident that he'll be able to come through to second either. Some dismissed his claims as typical Lewis blarney, but the base part of his logic seems irrefutable. But what of Red Bull, Merc's closest foe of recent times? The RB12 will likely be untouchable through the long turns of Spa's middle sector, and the key question is whether they can cede less than that through the full throttle blasts elsewhere, what with the infamous Renault power deficit. It might not be that unlikely, as the Bulls didn't appear to be giving up all that much on top end clip in Hockenheim last time out before the break, and kept Lewis very honest on what was predicted to be a track that wouldn't suit the Milton Keynes cars. Daniel Ricciardo won here two years ago, and didn't let a down-on-power Renault unit stop him that time either. For Ferrari though things remain iffy. Its power unit remains a good one which will help here, but what will not help is a chassis with downforce that by the squad's admission has not improved since May, while the words of boss Maurizio Arrivabene in Hockenheim suggested that this wasn't destined to improve any time soon. But it'll be worth keeping half an eye on Kimi Raikkonen. He long has been viewed as a Spa specialist, and with reason given he has four wins here to his name as well as several other strong performances. 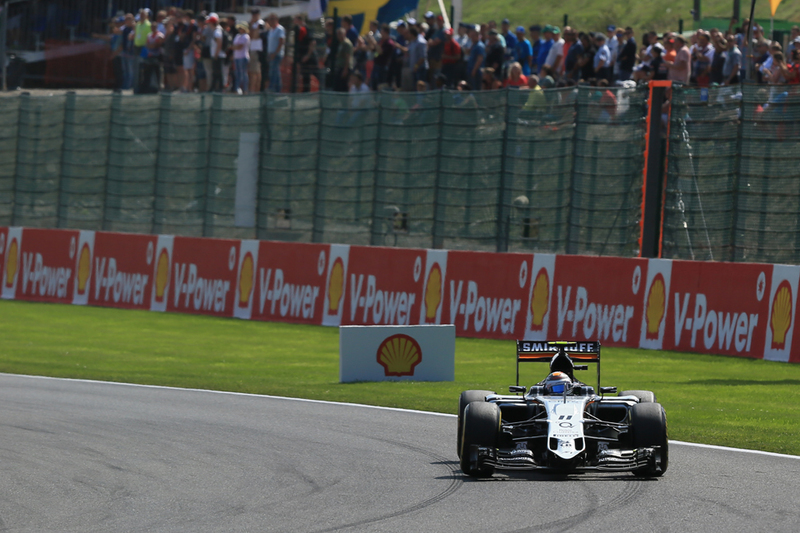 The lengthy full throttle sections of Spa should tilt things generally to those with a Mercedes power unit. Force India for one has a good record at this track - Sergio Perez finished P5 here 12 months ago - and it helps that it tends to go like a bullet in a straight line. Manor, another with a Merc unit in the back, often is fastest of all in the speed traps and will be worth watching for a better than usual result. And its newly-established Mercedes young gun driver match-up of Pascal Wehrlein and Esteban Ocon will be a fascinating one, not least because it could have large bearing on where they'll drive in 2017. 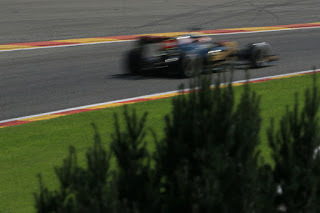 But of course we must include in our considerations the many peculiar things about Spa, that which go a long way to ensure that races here rarely are straightforward. First off there is the perennial. As the name of the place indicates water is hard to escape from here, and the track is situated in a notorious micro-climate meaning rain can and often does arrive with little warning and sometimes in vast quantities. Weather forecasts, even localised ones, are often of little consequence; virtually no Spa weekend passes without rain at some point. You can add to this too that with the long lap - it's the longest in modern F1 and more than twice the length of Monaco - covering a vast area it can be rainy on one part with the rest dry, and the length of the lap also means being on the wrong tyre at the wrong moment can really be punished. This all can turn the order onto its head. It's not only the precipitation that can change at a blink here. The temperature also can vary wildly from hot to positively chilly, sometimes also in a blink. Forecasts right now suggest we'll get the former this weekend, but for the reasons given they might not be too reliable. And this is but one of several set-up challenges here, as even at the best of times a set-up compromise has to be found here between the lengthy flat out sections of the first and third sectors of the lap and the more twisty middle sector which features turns such as Pouhon and Stavelot. You can add too that rain can curtail set-up time in practice plus last year accidents and resultant red flags in Friday running had a similar effect. 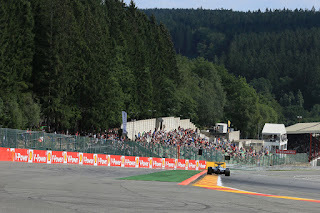 Indeed it all came into sharp focus in the 2012 meeting, as some of the famous Spa rain reduced dry running in practice to a handful of laps, and Jenson Button by luck or judgement landed upon an ideal set up which prioritised straightline speed. And it contributed to a surprise, and surprisingly dominant, pole and win for Button, as well as to a jumbled-up grid with the Saubers and Pastor Maldonado's Williams high up, Hamilton just seventh and Sebastian Vettel down in tenth. Not even this is the end of it, as tyre wear is high at this track with its long and quick corners. If practice is disrupted this further confuses calculations. As do safety cars and virtual safety cars in races - also relatively frequent at this circuit - which can dictate pit stop timing. This rather came together in last year's Spa race when most thought a two-stop was the default, with some perhaps being nudged to three if wear was excessive. But Ferrari with Vettel against all expectations went for a one-stopper on the day, but it went wrong as a Pirelli went pop just before the end. Throwing yet more into the pot, the length of the lap makes pit stop timing even more critical, as one will not be rewarded for a four mile lap of a set of Pirellis that have hit the cliff. And you can add one final thing. Pirelli is bringing a compound a notch more aggressive than last year, with the supersoft available this time along with the soft and medium of before. The top ten presumably will qualify on it and therefore do the opening stint on it, which may make three stops the way to go this time. But another good thing about Spa is that a poor qualifying slot isn't necessarily the end of your hopes, for the myriad reasons outlined. Even before DRS and gumball Pirellis race-day progress at this place was much more of a probability than at most other tracks. DRS of course makes such progress more presentable still. To wit - the pole sitter has only won this Grand Prix five times in the last 15 years. And there's yet another thing you can add - which is the race's opening corners. The tight La Source hairpin just after the start is the scene of plenty of carnage and the picture can look very different exiting it compared with that when entering it a few seconds earlier. Then there is the extended full throttle run to Les Combes mentioned, which with the resultant slipstreaming has led some to even theorise that starting second is better than starting first here. 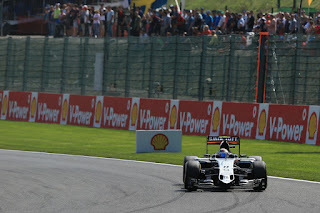 Perez from fifth on the grid actually led for a few metres before Les Combes on lap one last year. Yet even over and above all of this Spa has another intangible quality - things, somehow, happen here. Things that were almost unimaginable in advance. Make sure you're in place for this one.